Justin and Ashley first met in high school. A month after they had a class together, he asked her to prom and the rest was history. For his proposal, Justin had a little help from their cat, Bella. He'd made dinner for Ashley and as she talked about her day, she bent down to say hi to Bella and noticed a piece of her baby blanket on the cat's neck. 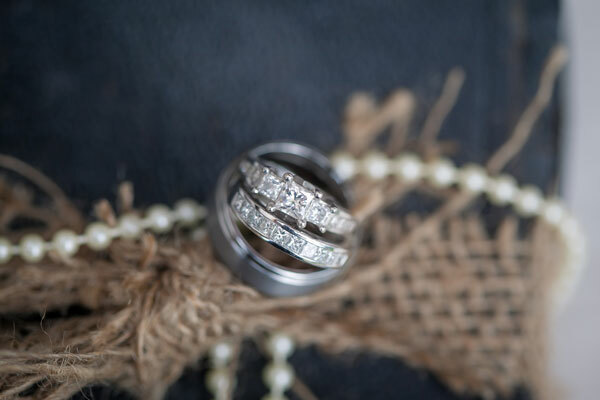 Her gorgeous ring was attached and before he could even ask, she shouted "Yes!" 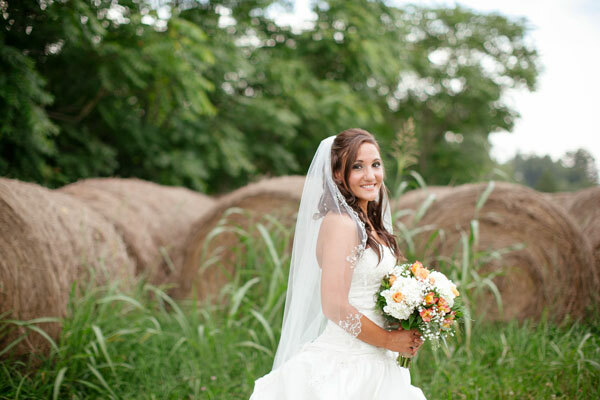 Ashley describes her favorite moment of the wedding when she walked down the aisle towards her future husband. The preacher read a poem in honor of her father, while her brother gave her away; she wiped away Justin's tears and cried with him and she knew that was the happiest moment of her life. Many of the details of their wedding were handmade, including signs and borrowed antique furniture and china. Ashley spent months thrift store shopping and crafting, plus her bridal party helped with calligraphy and more. An old door was made into a chalkboard for the dinner menu, while an old frame became a chalkboard wedding program. Ashley's favorite part of the details were her handmade wedding invitations. 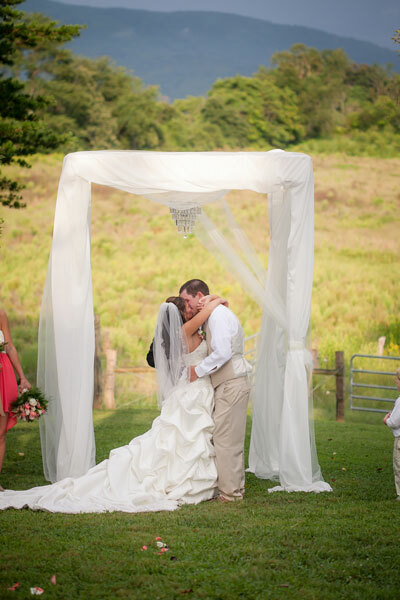 Their vintage country wedding took place on a farm overlooking the Blue Ridge Mountains, with hay bale seating for the ceremony. Centerpieces were candleholders with lace and pearls, while mismatched flower vases were filled with wildflowers and greenery grown during the summer. Some tables also had books and dollies to add height to the vases. Guests were welcomed to the candy bar with everything from Skittles to gummy bears and personalized suckers. Ashley's mother cooked all the food, including fried chicken, pork loin, green beans, mac and cheese and more, while her aunt made apple pies and peach cobblers. The newlyweds took a cruise honeymoon that stopped in Roatan Honduras, Belize, and Cozumel Mexico. 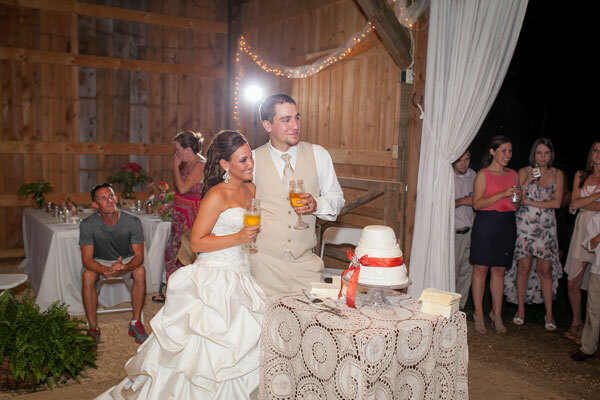 Be sure to see the Tice wedding on page 80 of the second issue of bridebook, on newsstands now!